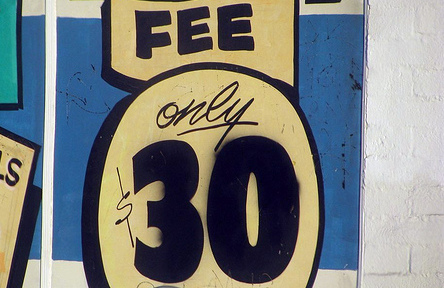 Are You Better Off Paying Fees to Meet Minimum Credit Card Spend? I’ve been working on some minimum spend lately, thanks to a new Chase Ink card and the Chase Sapphire Reserve. Those two cards mean I have to spend $9,000 in the span of 90 days, which can be a bit harrowing for some and a breeze for others. Once I was approved, and had yet to receive the cards, I began brainstorming ways to meet the spend to earn the bonuses. Whenever I’m faced with a spending challenge, my mind gets going like it’s some sort of exciting new adventure. It will consume me until the job is done. And usually I overshoot the target. But something occurred to me recently – was I spending unnecessarily to meet these spending thresholds? Was I going out of my way to find new methods to spend money, and in effect, losing at the game of credit card bonuses? Most importantly, was I wasting time? When you’re faced with a big spending requirement, you might throw caution to the wind and get cavalier with your cash. For example, you might agree to buy everyone a round of drinks, or pay for dinner, knowing you’ve got to spend $4,000 in a hurry. Hey, I can earn 3X on dining so let me pick up the tab. Fail. You might even be excited when the price tag is higher than you expected. If that’s the case, you might want to give pause. After all, if you just agree to pay some small fees you can accomplish the spending without buying anything you don’t need. Or without buying things for other people, not that generosity is a terrible thing. There are numerous ways to meet spending requirements that are free, but also many others that require a small fee. If you want to avoid getting in over your head, you can just pay the fees and move on with your life. And it won’t really be so bad. Just Pay the Fees and Move On? Take Plastiq. The service allows you to pay your rent or mortgage for a small fee. Without the promo, it’s 2.5%. If you happen to spend the entire $4,000 on it to pay rent you’ll be set back $100. Yes, $100 is money and it’s not free. But at the same time, you’d be done and earn your bonus. And you wouldn’t have to research ways to meet the spend, drive around town buying gift cards, go shopping, etc. Then you’d have your 100,000+ Ultimate Rewards points in your account and you could move on with your life. While it may be cliché, time is indeed money, and if you’re spending a lot of time figuring out how to spend your money, is that not a double whammy? As noted, you could get careless and overspend in one place and easily drop $100 or more on something you don’t need. So sometimes it might just make sense to bite the bullet and pay the fee. Another example is GiftofCollege.com, which allows you to contribute to a 529 account for $5.95 per $500. If you really wanted to beef up your kid’s college account, you’d be looking at $47.60 in fees. I’m sure you wouldn’t need to do all $4,000 because of regular spending on bills and other stuff, but just to illustrate, that’s less than $50 to hit the bonus. Again, one stupid move trying to meet the spend could easily cost you more than $50. My point here is that sometimes it might just make sense to pay the fee and move on with your life…because you’ve got better things to do, and it might just save you some money.